At AlfaClear Drains we have a range of different clients from residential properties with kitchen leaks, burst pipes and the usual emergency plumber callouts… Through to restaurants with blocked waste pipes, kitcken blockages and blocked drains. 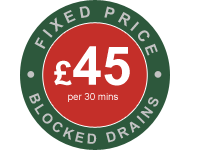 Using the latest technology and methods AlfaClear Drains are able to remove any blockages and repair blocked drains in London and surrounding areas. AlfaClear are specialists in clearing and repairing all types of blocked drains London, including waste/sewer drains, storm drains, blocked toilets, and blocked basins and sinks. Using the latest industry approved water jetting equipment enabling AlfaClear to clear and fix any blockages efficiently and as a result saving you time, money and hassle! AlfaClear are also experts in identifying faults and blockages using CCTV Survey equipment and also have years of experience fixing collapsed drains in and around London. Our high pressure water jetting equipment are the latest technology in the industry and guarantee the best results possible – every time! These machines are built to cope with all manner of block drains; from tree roots damaging and blocking the pipe – right the way through to kitchen fat and food blockages in kitchen wastes and drains. Using the latest CCTV Survey Drain inspection equipment enables AlfaClear Drains to efficiently identify any causes of blockages to drains including finding debris, fat/food blockages, tree roots penetrating the drain and any other faults. AlfaClear can provide reports for insurance purposes and serve CCTV Drain Survey’s for both residential and commercial properties.